Fay Victor’s monthly performance at 55Bar is one of the most happening things in New York City these days. Full of soulful energy and crisp with fresh ideas, Victorpicks the audience up and carries them along on a delectable journey. On July 28, the voice artist led her band on a special night that also was a celebration of her birthday and even brought a cake to share with her biggest fans. Victor’s band included tenor saxophonist James Brandon Lewis, keyboardist Aruan Ortiz, guitarist Marvin Sewell, bass guitarist Jochem van Dijk, and drummer Jason Nazary. 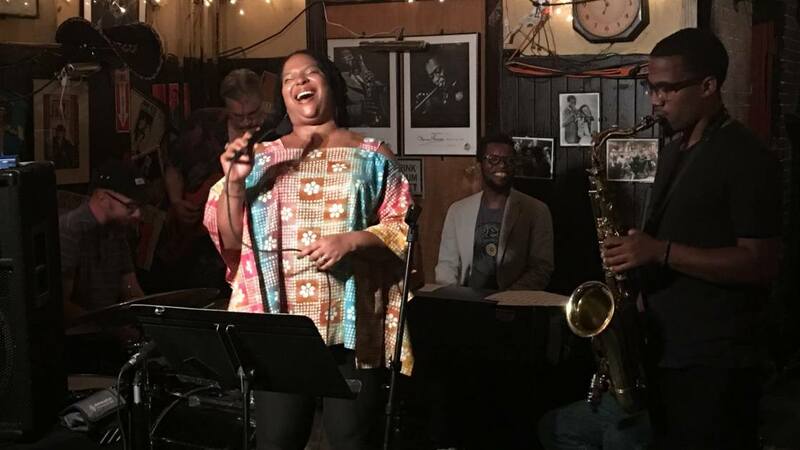 In addition, she had a deeply talented pool of special guests from which she drew, including alto saxophonist Darius Jones, trombonist Ben Gerstein, vocalist Kyoko Kitamura, and dancer Patricia Nicholson. For the first set, Victor played standards, including “House of the Rising Sun”, “Blue Monk”, and “How Could I Do It Blues”, before opening the fourth piece with an open improvisation that led into “If I Had My Way” with which she occasionally improvised her own lyrics. Throughout the set, Victor connected with the audience by giving them a little taste of something familiar, then moved forward into the unknown. The personnel alone indicates Victor’s approach to standards is unconventional and she kept each piece fresh, bold, and bristling with originality, while still connecting to the tradition of the music. The second set moved further into the experimental zone, as she featured different guests in rotation. The set opened with Nicholson doing a improvised dance as well as presenting a piece of poetry dedicated to Victor for the occasion. Then the two voice artists Victor and Kitamura joined Nicholson for the boldest experimentation of the night. Next Victor’s own piece, “I Sing” brought some of the instrumentalists back on stage–Sewell, Jones, and Gerstein, for an improvised set before all of the musicians joined for the closing piece. Check out Fay Victor’s musical magic at 55Bar on the fourth Thursday of each month. It is an experience not to be missed. Her next performance is August 25th with Marvin Sewell and bassist Sean Conly.